Easily customize "Cut off day", "Exclude day, backout days"
Magento Order Delivery Date and Time extension empowers customers to define available delivery date and time for receiving their orders. *Note: Order Delivery Date and Time for Magento extension does not support multiple-address checkout. 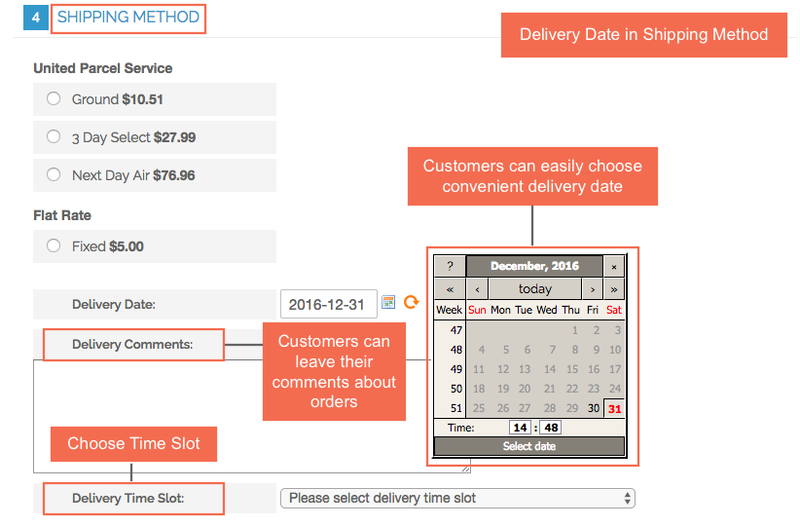 Customers can choose a day as an expecting order delivery date among availables ones in a given calendar in Shipping Method, or Order Review or right in Magento Product Page. Customers can also choose which time slots they want to receive the goods with Order Delivery Time Slots function. Show Order Delivery Date column in Order grid view page in the backend of your Magento store. 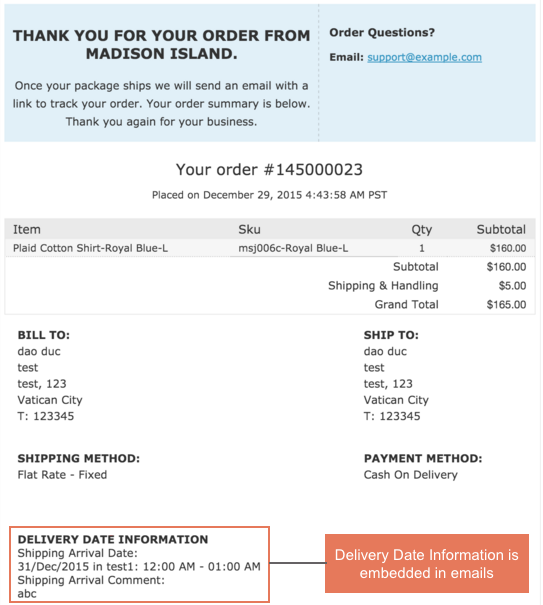 Add Order Delivery Date, Delivery Time Slots and Shipment Arrival Comments to order confirmation emails. Why Magento Order Delivery Date and Time Extension is your must-have extension? Order Delivery Time notification is one of the most important factors in every order. Magento Order Delivery Date and Time extension supports emails added with order delivery date in which shall be sent to your customers. You now can engender customer satisfaction for receiving a functional notification email with delivery arrival time, which are always available for them whenever they want to conduct with this extension. Order Delivery Date and Time information obviously comes to light in every Magento order, shipment, invoice and credit memo. You shall not spend time on reminding each particular order delivery date for each order. Being integrated into each order, delivery date notification shall be placed as a new part of every order created by admin from the backend. This helps to manage submitted customer information more thoroughly and makes it easier for admin to implement deliveries punctually with Magento Order Delivery Date and Time extension. More specially, all the needed information of order including order delivery date can be printed quickly just after when you click “Print” button on the right-hand side of each invoice, shipment or credit. With a handy and tangible pdf file of invoice, shipment or credit, your shippers could never miss any orders. When your shippers locate in some inconvenient places where there is no wifi or internet, your shippers might suffer from crisis when they cannot remember the order delivery date information or other important information of orders on site. An advanced version of Magento Order Delivery Date and Time extension automatically set up a neat space for delivery date information in the order in handily physical pdf files. I've chosen your extension as it's cheaper than the same-like by Amasty and offers alike functionality. Besides, I have a 1-year free support instead of 90 days. I like Magento Order Delivery Date. Cheap but good. The module works well as described, meets simple requirements. "It is one of the extensions which exactly does what it shall do, it works perfectly. But there is more. Great support. We've got customers using magento, our job is to install, setup and administrate their shops. Sometimes we need really quick solutions to satisfy our customer's needs, so we have got to use third party extensions and therefore we are used to collaborate with external developers. The support of BSS is extraordinary customer friendly and fast. Customizations are no problems and are done as expected. Last but not least the price for the extension and the customization is more than fair. We love to recommend this extension and this company." "The support was really good and they guide me through any trouble I had. Once the extension was up and running everything worked fine and as described"
Nothing more to say here!! I'd been looking for something like that for quite a while. It's simple, it's flexible, and it's reliable. "I thought that I gotta have this extension at the first sight to solve all my problems related to dilivery date. And it turned into real, I got it and now it's so easy for me to follow customer special orders. You guys rocked the busines!." "We installed this and eveything works very good. After contacting BSS Support we asked for some changes for our stores. The changes were made by BSS Group and worked as requested! Great extension for a reasonable price. Support is also very great." This extension by BSS is relatively cheap compared to others. They also offers free installation and free supports for lifetime. I have to say this module is really smart and do all what they advertised. It automatically disables the date that is not active then makes the interface more professional. Great solution! Thanks for Order Delivery Date, we have saved a lot of time for both customers and shippers. It saves money as well. More importanlty, this module has enhanced our service. I'm absolutely impressed by this modules. It provides variety of features and everything goes smoothy as it's said. Customers now have more choices about the date and time they receive goods and We can manage and arrange suitably to ship goods. It's really excellent module! The extension works exactly as advertised! Very happy with it, will be making some changes to the view of the calender but other than that would definitely recommend anyone who needs an extension like this to use this one! We have installed Order Delivery Date for few days and see great return from it.